St. Urith or, more properly, Iwerydd was born at East Stowford, near Barnstaple, in Devon. Little is known of her life, but she is known to have founded the church at Chittlehampton, seven miles away. She was a consecrated virgin there, presumably a hermit, but was killed by local (apparently female) haymakers at the instigation of a jealous, possibly pagan, stepmother. She was cut down with a scythe and a miraculous stream immediately sprang up where she fell. This story is extremely similar to the legends of Saints Sidwell and Juthwara who were decapitated in the same and adjoining counties. It is possible that all three were martyred by Saxon raiders from across the border with Somerset in the late 7th century. Her name certainly indicates that she was of Celtic origin; though she is popularly assigned to the 8th or 9th centuries when her executioners would have been Viking invaders. Her feast day is 8th July. Urith was buried in Chittlehampton Church where her shrine became extremely popular with both the local people and pilgrims from further a-field. The village has the finest church tower in Devon, built with the money they gave in offering and the vicar had an income three times what he would ordinarily expect from the tithes and glebe. Like all pilgrimage centres, her cult was suppressed during the Reformation (1540) and her shrine and statue removed. Traces of the lady's veneration still survive however. The position of her shrine, where her body is thought to repose even today, is clearly identifiable as the small chamber off the north transept, adjoining the chancel. Children lay posies of flowers here every 8th July, after a procession to bless her holy well. The late 14th century pulpit also survives, bearing her image in stone. 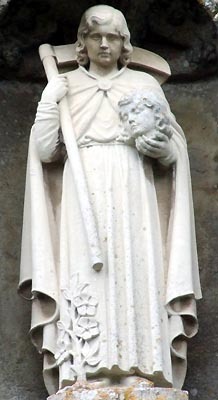 In art, Urith is variously depicted holding the palm of martyrdom and the foundation of the stone Chittlehampton Church, or accompanied by her cow and her well, or carrying her head and the scythe that killed her. There is a 16th-century stained-glass window of her at Nettlecombe in Somerset. Urith should not be confused with St. Erc of St. Erth (Cornwall) or St. Ewryd of Bodewryd (Anglesey).